A simple yet sophisticated-tasting chicken dish appropriate for any celebration. Liqueurs always make food taste better! Blend flour with salt and pepper in a shallow bowl. Dredge chicken in flour mixture to cover. In medium skillet, saute onions, bell pepper in grapeseed oil for 2 minutes, then add chicken. Brown chicken for 2 minutes on each side. Add mushrooms and cook for 1 more minute. 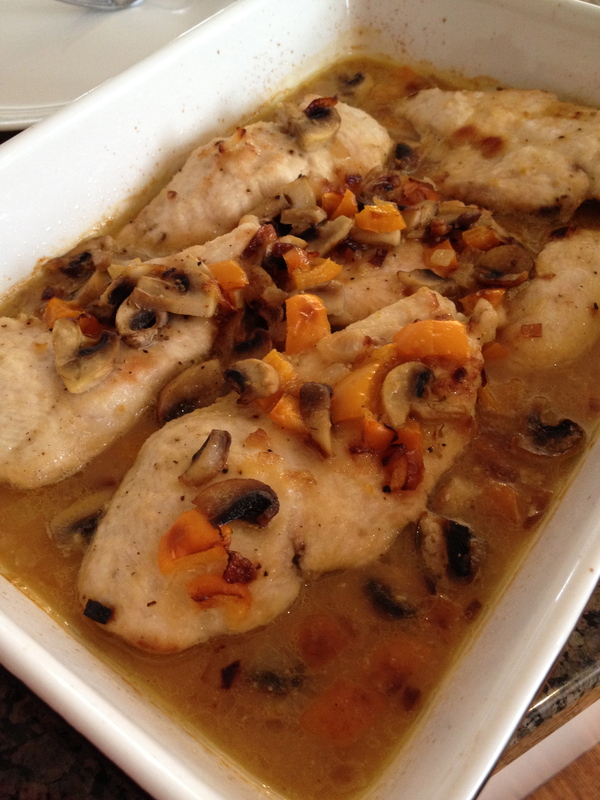 Place chicken and vegetables in a prepared 9 x 13 baking dish. In original skillet, on medium heat stir in Dijon mustard, chicken stock, orange juice, Amaretto, almond extract, and pepper. Cook for about 3 minutes. Pour liquid onto chicken and cover dish. Bake at 365 degrees for 30 to 35 minutes.